Following on from Deer Tick: Vol. 1 and Deer Tick: Vol. 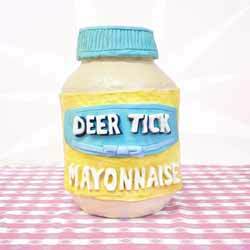 2, Deer Tick release their new LP, Mayonnaise, via Partisan Records. The album contains 13 songs (48 min, 38 sec) and some might feel a little cheated that a few of the songs on the album are "alternate" versions of songs already released on the previous albums, but they're such good tracks, that having another version makes for interesting listening. However... when you strip those songs out you're pretty much left with an EP... and I can quite easily understand why some of their fans might feel a little short changed. It's not a bad album, but then again it's nothing overly spectacular. In fact, for me the only track to really stand out, mainly because it was a little different, is the jazz-based instrumental 'Memphis Chair'.